Let there be light! That’s what God said when he first created the world. But did you know, he also said it about us in Ephesians 5:8? So what does this mean? Does it mean live as if you’re a famous rock star and all the world’s a stage with the spot light on you? Of course not; you already know this. If you’re Christian, you already know just how dark, how shameful, how sinful you perhaps once were, or currently struggle with, or have the capacity to be. That’s because our flesh wants what it wants. We want control. We want things, people, power or influence. It’s the underlying motive beneath all our wants that determines whether we are walking as children of the light or darkness. I snapped this pic of Bono at the 2nd of only three concerts I’ve ever seen him. He was so close and yet….so far away. It was taken with an ordinary point and shoot camera at just the right moment, a split second of perfect timing. It almost seems like heaven’s light is shining down. But I know the truth. Bono is only a man. Nothing more; nothing less. He has made references before that he doesn’t feel comfortable if fans (strangers to him!) see him as a Messiah. He’s clearly not. Yet, he does carry a certain light, or at least seems to be perceived that way by tens (hundreds?) 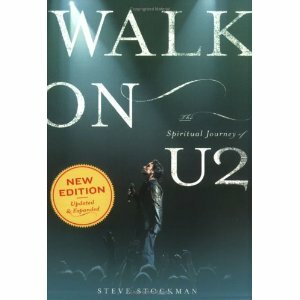 of thousands of U2 fans, and maybe even some people that aren’t even big fans of U2’s music. That’s because of his heart. If you follow news about him then you know what he’s done to shine a light on Africa, and how he’s been instrumental in trying to reduce and eliminate hunger, poverty, political corruption, and the hopelessness these things cause. You know he’s worked with world leaders in the political arena to bring attention and change to a silent suffering. He’s used his rock star status to influence and to be a beacon of light—to bring attention to, hope, help, cure, and above all love at a time that clearly God has appointed for him. A higher frequency. This unmistakable calling of light. The example of a love in action, not merely words spoken or sung. He doesn’t just sing to us. U2’s lyrics challenge us. (“Am I buggin you? I don’t mean to bug ya!”) Kind of like Jesus. How are you going to step out today knowing what you know of the world’s pockets of suffering? Will you turn away in apathy? Or will you reach out in faith willing to risk your reputation or security? Are you brave enough to show goodness, kindness, compassion, or mercy today to someone you don’t know or is hard to love? Truth has a way of showing us which direction we’re going to walk in life. The incredible light that is ours simply by receiving. This incredible gift of love that is ours to multiply simply by giving it all away. So let there be light! Because you too are loved! The following exchange between Bono and Assayas took place just days after the Madrid train bombings in March 2004, an act of terrorism that left 191 dead and more than 1,800 wounded. 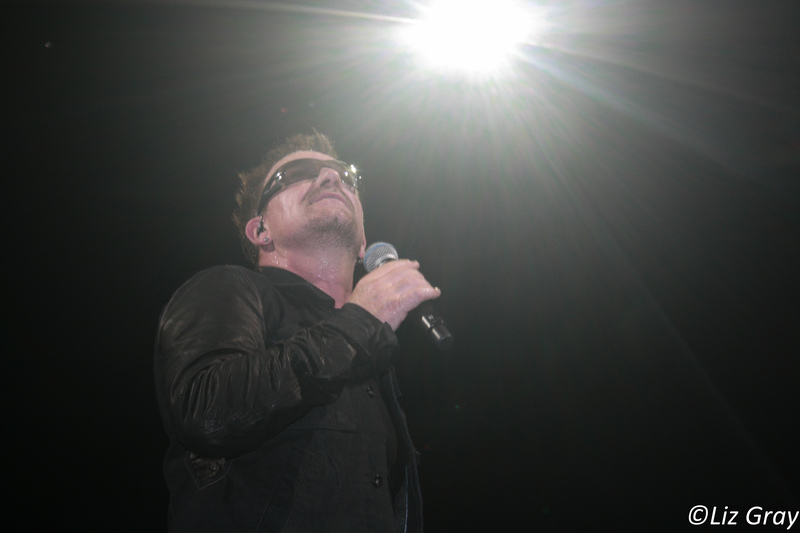 The two men were discussing how terrorism is often carried out in the name of religion when Bono turned the conversation to Christianity, expressing his preference for God’s grace over “karma,” offering an articulate apologetic for the deity of Christ, and giving a clear presentation of the gospel message. Bono There’s nothing hippie about my picture of Christ. The Gospels paint a picture of a very demanding, sometimes divisive love, but love it is. I accept the Old Testament as more of an action movie: blood, car chases, evacuations, a lot of special effects, seas dividing, mass murder, adultery. The children of God are running amok, wayward. Maybe that’s why they’re so relatable. But the way we would see it, those of us who are trying to figure out our Christian conundrum, is that the God of the Old Testament is like the journey from stern father to friend. When you’re a child, you need clear directions and some strict rules. But with Christ, we have access in a one-to-one relationship, for, as in the Old Testament, it was more one of worship and awe, a vertical relationship. The New Testament, on the other hand, we look across at a Jesus who looks familiar, horizontal. The combination is what makes the Cross. Bono I know, I know. Religion can be the enemy of God. It’s often what happens when God, like Elvis, has left the building. [laughs] A list of instructions where there was once conviction; dogma where once people just did it; a congregation led by a man where once they were led by the Holy Spirit. Discipline replacing discipleship. Why are you chuckling? Bono No, I can be critical, especially on the topic of contraception. But when I meet someone like Sister Benedicta and see her work with AIDS orphans in Addis Ababa, or Sister Ann doing the same in Malawi, or Father Jack Fenukan and his group Concern all over Africa, when I meet priests and nuns tending to the sick and the poor and giving up much easier lives to do so, I surrender a little easier. Bono … We all knew why we were there. The Pontiff was about to make an important statement about the inhumanity and injustice of poor countries spending so much of their national income paying back old loans to rich countries. Serious business. He was fighting hard against his Parkinson’s. It was clearly an act of will for him to be there. I was oddly moved … by his humility, and then by the incredible speech he made, even if it was in whispers. During the preamble, he seemed to be staring at me. I wondered. Was it the fact that I was wearing my blue fly-shades? So I took them off in case I was causing some offense. When I was introduced to him, he was still staring at them. He kept looking at them in my hand, so I offered them to him as a gift in return for the rosary he had just given me. Bono Nor did we. It seems his courtiers did not have the same sense of humor. Fair enough. I guess they could see the T-shirts. Bono I really believe we’ve moved out of the realm of Karma into one of Grace. Bono You see, at the center of all religions is the idea of Karma. You know, what you put out comes back to you: an eye for an eye, a tooth for a tooth, or in physics—in physical laws—every action is met by an equal or an opposite one. It’s clear to me that Karma is at the very heart of the universe. I’m absolutely sure of it. And yet, along comes this idea called Grace to upend all that “as you reap, so you will sow” stuff. Grace defies reason and logic. Love interrupts, if you like, the consequences of your actions, which in my case is very good news indeed, because I’ve done a lot of stupid stuff. Bono But I love the idea of the Sacrificial Lamb. I love the idea that God says: Look, you cretins, there are certain results to the way we are, to selfishness, and there’s a mortality as part of your very sinful nature, and, let’s face it, you’re not living a very good life, are you? There are consequences to actions. The point of the death of Christ is that Christ took on the sins of the world, so that what we put out did not come back to us, and that our sinful nature does not reap the obvious death. That’s the point. It should keep us humbled… . It’s not our own good works that get us through the gates of heaven. 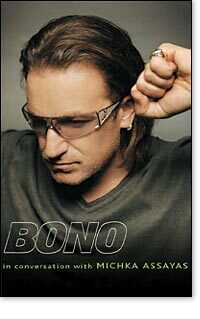 Bono: …If only we could be a bit more like Him, the world would be transformed. …When I look at the Cross of Christ, what I see up there is all my s— and everybody else’s. So I ask myself a question a lot of people have asked: Who is this man? And was He who He said He was, or was He just a religious nut? And there it is, and that’s the question. And no one can talk you into it or out of it. Bono That’s between me and God. But I’d be in big trouble if Karma was going to finally be my judge. I’d be in deep s—. It doesn’t excuse my mistakes, but I’m holding out for Grace. I’m holding out that Jesus took my sins onto the Cross, because I know who I am, and I hope I don’t have to depend on my own religiosity. From Bono: In Conversation with Michka Assayas, by Michka Assayas, copyright © 2005 by Michka Assayas. Liz’s Note: 11/19/12 — Hoping to post an original writing soon, but with so much unrest in the world these days, it’s inspiring to know we have an alternative to chaos in our life: Grace. May you find yours today! Dang it! I missed it. Do you know what solar phenomenon happened on June 5, 2012 that will not be repeated in our lifetime? It’s not an amazing meteor shower, or even a comet, such as the beautiful Hale Bopp comet seen all over the world in 1997. It was the solar event known as Venus in Transit. 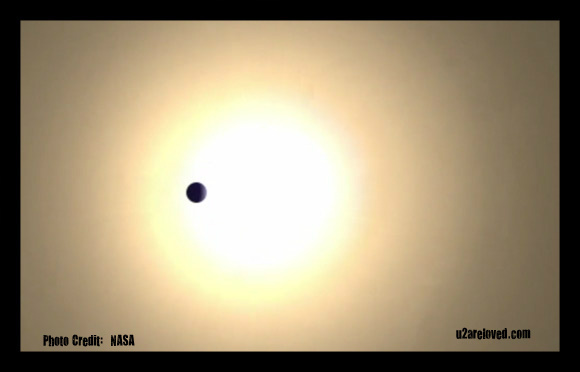 Here’s how it played out: Venus passed directly between the sun and the earth, but appeared as a black dot traversing the length of the sun on a journey just shy of seven hours. For anyone that would have witnessed this event at an observatory, a museum viewing, or with eyes shielded by welder-grade sunglasses, they would have witnessed a black dot slowly making its way across the sun for approximately seven minutes from their specific location on earth. This Transit of Venus happens every 243 years, with pairs of transits eight years apart that part company for about 105.5 and 121.5 years. Another words, the next paired transit, won’t happen until 2117 and 2125. This means, we won’t have a chance to witness this phenomenon again, at least not in our resident earthly body. Wikipedia informs us that this event is both predictable and rare. Predictable in that it has a proven historical track record, but rare in the fact, you have only a two-shot chance of witnessing this spectacular paired journey eight years apart. So if you missed it on June 5, 2012 and also June 8, 2004 then you will only see it now courtesy of cyber space, not celestial space. I’m sorry I missed this because I still remember Hale Bopp, not because of the freakishly strange cult suicides that resulted from its presence, but because like a diamond in the sky, it possessed the quality of brilliance and extreme rareness. I remember seeing the comet as it blazed across the sky, as a vivid light breaking through the darkness, gently hinting there is so much more here than meets the eye. Looking up, it appeared to be a window in the sky that alludes to something beyond what our mind can surely grasp. Strange as it sounds, when I saw it from our front porch, my first thought was how it reminded me of the Polar Express train of children’s literature—this magical train that breaks through the night, full of excited children, crossing space and time boundaries to deliver more than just Christmas gifts, but the gift of belief! This I know to be true in life: There is no such thing as coincidence! I will repeat that until my dying day. I am a firm believer that life is not random, but intentional. We are created to witness some great mysteries and miracles in life, but they will mean little more to us than coincidence without the gift of belief. I’ve always been enthralled by the mysteries of deep space. It humbles me, because I know that in the grand spectrum of the universe, my allotted space and time is absolutely microscopic. Think about this: Look at all you have witnessed and experienced in your own life, if only up until now: Moments of rare beauty, moments of extreme pain, birth, loss, dreams, obligations, music, love, oceans, mountains, sky, animals, and people—just a small millionth of all you’ve experienced, endured, heard, tasted, witnessed, and touched. Considering the vastness of our universe, is it mere privy that you’ve had the luxury of experiencing so much? You are not like the stationery planets that sit still, changing only on the surface. You are so much more! You are like Venus in Transit. You are given a mind to assimilate knowledge, belief, events, faith, and experience. Are all these things just random coincidence in your life? Or will you use it and connect the dots in your life, just as surely as a master Creator has an order for the stars and planets that dot our view of sky? Venus is named after the Roman goddess Venus that represents love, beauty, fertility, sexuality, prosperity and victory—not much–just the pinnacle of our enjoyable side of human existence. For me, I already believe this. Love passes by. Bono knows this. 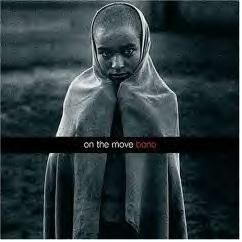 In fact he wrote a book called “On the Move”. He states that love, and mercy, and God are all on the move. Love is never static! It grows legs and walks into adversity and suffering. It extends arms and hands that provide sustenance, aid, and the potential to hold someone. Love is a cure. But it is not without cost. It puts hearts on sleeves and security on the line and makes us give out of what we’re not even sure we possess. See love knows we’re going to suffer. It knows we’ll see things we’d rather not. Love marches forward anyway. I keep a pocket full of miracles in my head and heart that no person can ever take away. Though most days I live life with feet planted firmly in terra firma in my town, my heart travels, and in in doing so, it keeps changing. It’s as though a puppet master is pulling the strings of my feet, arms, and heart, as He says, “Over here, child. Over here.” I don’t know if I want to go, or if I’m prepared. I do and don’t want to go. But like Venus in Transit, a rare and brilliant love capably pulls my orbit across and around the Son’s light. I don’t have to know the future or my exact destination as I journey across the universe. I wish you the same: Let the power of an eternal and regenerating love and light sustain you as you move through life.